• Pulse Generator, # 57800-001: UGO BASILE Biological Research Apparatus, Stoelting, USA (modified at TJL to generate a frequency of 299 Hz and a pulse width of 9.9 msec) see Figure 3 below. HF electroshock ECT tests at the University of Utah were conducted using an apparatus originally described by Woodbury and Davenport (1952), which generates sinusoidal wave pulses with the following properties: 60 Hz, 16-ms pulse width, 0.2-s shock duration, constant current. 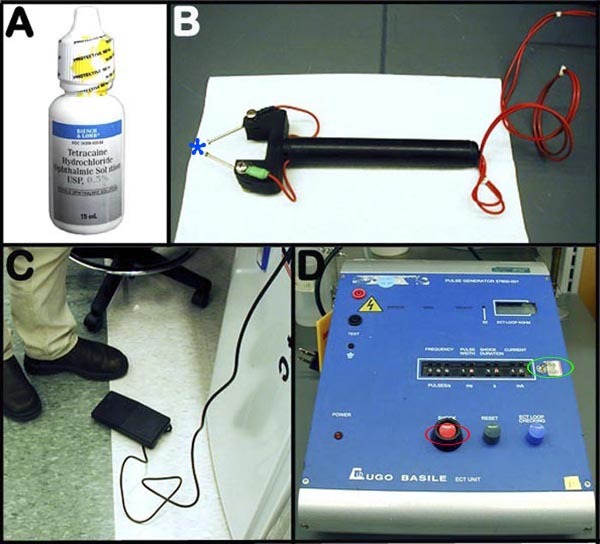 LF electroshock was done at the University of Utah with a Grass stimulator (Model S4B) and at The Jackson Laboratory with the Ugo Basile device, using identical settings: 6 Hz, 0.2-ms pulse width, 3.0-s shock duration, constant current. At The Jackson Laboratory, HF electroshock was done using the Ugo Basile (Model 7800) electroconvulsive device (Stoelting Co., Wood Dale, IL), modified from factory settings to deliver rectangular wave pulses at 299 Hz, 1.6-ms pulse width, 0.2-s shock duration, constant current. An additional modification made to the Ugo Basile device allowed current to be increased in steps of 60.5 mA (former increment was 61.0 mA). There are some substantial differences between the Ugo Basile device and the stimulator originally described by Woodbury and Davenport (1952) - the latter being the major of two devices used in the anti-epileptic drug development program (ADD) at U. Utah. For high frequency stimulation of minimal clonic or maximal tonic hindlimb extension seizures, the Ugo Basile device delivers rectangular wave pulses, different from the sinusoidal waves generated by the Woodbury and Davenport stimulator. In addition, the maximum pulse widths are comparatively narrower in the Ugo Basile device (0.9 ms vs 16.0 ms), requiring approximately 10-fold higher current levels to yield the same seizure response. Instead of using unnecessarily higher currents, we modified the Ugo Basile to bring its parameters closer to those of the Woodbury and Davenport stimulator so that we could evoke the same response at lower current. The Ugo Basile device was therefore modified at TJL to give a maximum pulse frequency of 299 Hz (former maximum was 100 Hz), and a maximum pulse width of 9.9 ms. One concern, however: we have recently acquired a second Ugo Basile device and in modifying it, we learned that the manufacturer's specifications as shipped do not consistently support our modifications. For example, there appears to be some variation in fall-time (from peak current) from device to device (this variation matters less when the pulse width is 0.8 ms versus 1.6 at 299 Hz versus 60 Hz). Although appropriate further modifications were done to remedy this problem, one needs to be prepared to measure output (e.g. using an oscilloscope) to be certain the performance of each device is as required by the user. For low frequency stimulation, the rectangular waveforms generated by the Ugo Basile device have much more similar parameters as the Grass Stimulator (Model S4B) used by the ADD program, so no modifications were necessary. To improve the resolution of the Ugo Basile device a switch was added so that current could be increased in steps of 0.5 mA (former increments were 1.0 mA). Figure 3. Panel A shows an example of a topical corneal anesthetic solution. Panel B is a photographic image of a transcorneal electrodes (blue asterisk) probe. Panel C depicts the foot-control switch for the ECT system. Panel D is a photograph of the modified pulse generator apparatus (green circle = added switch to improve resolution; red circle = pulse stimulus button). Mice shipped to the University of Utah were allowed to acclimate to the new environment for at least 3 days before testing was begun. a. The 6-11 wk-old mice are tested for the occurrence of minimal clonic seizures. b. Mice are manually restrained via the cervical scruff, and before corneal electrode placement, one drop of Tetracaine topical anesthetic solution is applied to each eye. c. The pulse generator is set to 6.5 mA for female, and to 8 mA for male mice, the estimated critical current intensity for minimal seizure induction in 3% of the population for 6-10 wks old C57BL/6J mice. The pulse frequency, width and duration are set to 299 Hz, 1.6 ms and 0.2 s.
d. Transcorneal stimulation is activated via the foot-control switch. e. Immediately after transcorneal stimulation, the mice are placed into a clear plastic box for observation and the behaviors are scored according to seizure duration and degree of generalization (0 = no observable symptoms, 3 = rearing, forelimb clonus and jaw clonus, 5 = tonic hind limb extension seizure). Intermediate scores (1, 2, 4) are also noted for future reference. f. Mice, including those exhibiting low seizure thresholds, are further investigated by examining their susceptibility to seizure preventing drug such as lamotrigine (see below). g. A critical current stimulus-response curve (see below) is established before hand for each strain before additional ECT measurements are obtained. h. The observation box is cleaned and disinfected after each use. a. Approximately 20 mice are used to generate a meaningful critical current stimulus-response curve. b. The staircase procedure is used to estimate the critical current for 50% (CC50) of these mice (n = 10) to reach a seizure response, although best results are obtained when most of the current levels yield between 84 - 16% response or endpoint. c. The first mouse is optimally tested at an estimated CC50 (either previously determined by other pilot studies, or an educated guess), and then the response curve is 'filled-in', such that at least 8 mice are tested at each current. d. If the endpoint is reached (or is not reached) in the initial mouse, the current is titrated by decreasing (or increasing) with an appropriate increment (e.g.+ 0.5 or - 0.5 mA) for the subsequent mouse, and so on - up and down the "staircase" - until the entire group of 20 mice is tested. This is designed to collect data around the median response level. e. The raw response data are then analyzed using a Macintosh computer program (MINITAB) that applies maximum likelihood estimates to the log-probit determination of CC50 and 95% fiducial confidence interval for the group of mice within a strain. f. Summary results are stored and plotted using Excel spreadsheet software. g. Statistical significance between groups is determined in regression tables in the Probit analysis provided by the computer program MINITAB. a. To produce either minimal clonic seizures or maximal tonic hindlimb extension seizures, the critical current of the high frequency (HF) electroshock stimulation is adjusted accordingly (see above). b. High frequency (HF) ECT tests are conducted at the University of Utah using an apparatus with sinusoidal wave pulses, and with the following properties: 60 Hz, 16-ms pulse width, 0.2-s shock duration, constant current. At The Jackson Laboratory, HF electroshock is done using the an electroconvulsive device modified from factory settings to deliver rectangular wave pulses at 299 Hz, 1.6-ms pulse width, 0.2-s shock duration, constant current. An additional modification made to the device also allows current to be increased in steps from 61.0 mA to 60.5 mA. c. A seizure is scored as minimal when it satisfies the minimal criteria up to or including neck flexion, but does not include tonic hindlimb extension. d. Minimal seizure is scored with the manifestation of rhythmic jaw and forelimb clonus including arm movement, and it can also include rearing and falling and ventral flexion of the neck. e. Maximal seizures is scored following a tonic-clonic flexion/extension sequence, starting in tonic extension of the fore forelimbs and terminating in the definitive endpoint- full tonic hindlimb extension (hindlimbs at 180° angle to the torso). f. Low frequency (LF) electroshock is used to evoke partial limbic, or psychomotor, seizure. g. Low frequency electroconvulsive test is conducted at the following settings: 6 Hz, 0.2-ms pulse width, 3.0-s shock duration, and constant current. h. Depending on the strain and gender, the currents are adjusted from 8 mA to 20 mA. i. Psychomotor seizures are scored when rhythmic face movements and extensive forelimb clonus (e.g. "shadow-boxing" forelimb movements), dorsal flexion of the neck, rearing and falling, and/or transient wobbliness/ataxia are observed. Psychomotor seizures lasts only 10-15 seconds and when antiepileptic drugs are present may last only a few seconds. j. An example of the responses plotted against the range of currents in different common inbred strains can be viewed in the following graphs: Graph 1 and Graph 2.
a. On the day of testing, a stock solution of lamotrigine is prepared as a suspension in 0.5% methylcellulose in a glass Dounce homogenizer. b. Dilutions are made from the stock solution to provide a concentration sufficient to deliver the desired dose in a volume of 0.1 mL/10 g body weight (about 200 µL for a mouse weighing 20 g). c. 15 min after intraperitoneal (i.p.) administration of lamotrigine, each mouse of a given strain is tested at its respective 97% critical current response level (CC97) by an operator who is blinded to the anti-epileptic drug concentration. d. To determine the median effective dose (ED50) for anti-epileptic drug lamotrigine, the time to peak effect (TPE) of the drug is first determined, and 4-5 mice are tested first at 3-4 drug concentrations based on ED50 estimates obtained either by other investigators, or by using the drug dose for other strains, or via an educated guess. e. In order to obtain the ED50 (effective dose for 50% response to be abolish) for lamotrigine, the critical current is fixed at the CC97 level previously measured for the strain (see above), i.e. the estimated critical current intensity for minimal seizure induction to occur in 97% of the mice of the same strain. f. To complete the experiment, the remaining subjects are tested at doses estimated to flank the ED50. The dose of lamotrigine is varied between the limits of 0 and 100% protection (i.e. everyone in a group seize to none in a group seize) and the median effective dose is determined by a log-probit procedure, as described above. g. Typically, at least 40 mice are required to obtain reliable results for an anti-epileptic drug response curves. h. Cross-site (Bar Harbor vs. Salt Lake City) comparison of lamotrigine ability to block high frequency electroconvulsive seizures is evaluated as shown in the following table. A major alternative to transcorneal ECT determination make use of the frontal lobe stimulation (see Wlaz et al., 1998 and Figure 4 below). Frontal stimulation is used as a potentially less invasive alternative for large scale screening and repeated testing. a. The frontal stimulation is used for both minimal clonic and psychomotor seizures (depending on exact electrode placement), as well as for use in maximal tonic hindlimbs extension seizures. However, other work suggests that seizure thresholds are relatively lower with frontal stimulation. b. Four strains consisting of 32-51 males are screened for minimal clonic, maximal tonic, and psychomotor seizure responses via frontal ECT stimulation. c. Based on previously determined critical current transcorneal stimulus- response curve (see above), similar critical current frontal stimulus- response curve is also established for the determination of CC50 for minimal clonic, maximal tonic, and psychomotor seizure responses for the above four strains. d. As in transcorneal stimulation, mice are manually and securely restrained via the cervical scruff before frontal stimulation is administered. e. Once a mouse is adequately immobilized, the same probe used for transcorneal stimulation (see Figure 3B above) is placed above the medial canthus of the eyes, above the frontal bones (see Figure 4 below), such that frontal stimulation is then activated via the foot-control switch. 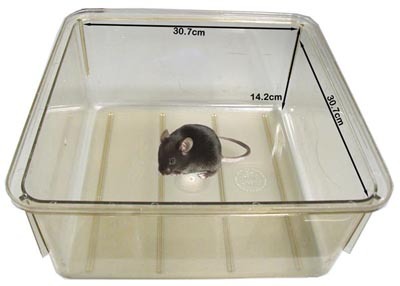 f. Immediately after frontal stimulation, the mice are placed into a clear plastic box (see Figure 1) for observation and the behaviors are scored according to seizure duration and degree of generalization. g. Seizure responses or endpoints are scored in the same manner as with transcorneal stimulation (see above). h. Similar results obtained from transcorneal electrodes are expected from frontal stimulation (see Graph 1 and Graph 2). Submitting investigator's note: "... we are concerned about the subjectivity of the stimulation, i.e. controlling the amount of pressure applied, which can influence the results if not standardized properly." 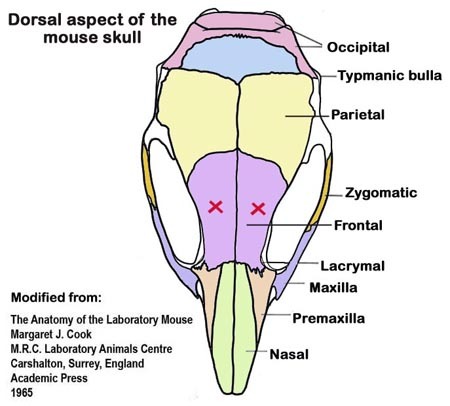 Figure 4: An illustration of the dorsal aspect of the mouse skull. For frontal stimulation, the frontal bones are marked (red X) where ECT electrodes are to be placed. • Critical current [mA] required for 50% (CC50) of mice to reach minimal clonic seizure via frontal, and transcorneal stimulations (at Bar Harbor and Salt Lake City). • Critical current [mA] required for 50% (CC50) of mice to reach maximal tonic hindlimb seizure via frontal, and transcorneal stimulations (from Bar Harbor and Salt Lake City). • Critical current [mA] required for 50% (CC50) of mice to reach psychomotor seizure via frontal, and transcorneal stimulations (at Bar Harbor and Salt Lake City). • Median effective lamotrigine dose (ED50, mg/kg) against minimal clonic seizures (CC97) via transcorneal stimulation (at Bar Harbor and Salt Lake City). • Median effective lamotrigine dose (ED50, mg/kg) against maximal tonic hindlimb extension seizure (CC97) via transcorneal stimulation (at Bar Harbor and Salt Lake City). Critical current (CC): the level of stimulus needed to evoke seizure response or endpoint. To obtain CC50 response level, 50% of the mice tested need to manifest a seizure response or endpoint. High frequency (HF) electroshock stimulation: 299 Hz intensity, 1.6-ms pulse width frequency, 0.2-s shock duration, constant current. Lamotrigine: an anticonvulsant drug used in the treatment of epilepsy and certain mood disorder. Low frequency (LF) electroshock stimulation: 6 Hz, 0.2-ms pulse width, 3-s shock duration, constant current. Minimal seizure endpoint: is manifested as rhythmic jaw and forelimb clonus including arm movement, rearing, falling and ventral flexion of the neck. Minimal clonic seizures involve stimulation of the forebrain are induced by corneal or frontal electrodes. The minimal seizure endpoint may vary slightly qualitatively from strain to strain and for this reason it is important for the investigator to be consistent in defining common endpoints within and between strains. In practice, a seizure is scored as minimal when it satisfies the minimal criteria up to or including ventral flexion, but does not include maximal tonic hindlimb extension. Maximal seizure endpoint: manifested as a tonic-clonic flexion/extension sequence, starting in tonic extension of the forelimbs and terminating in the definitive endpoint- full tonic hindlimb extension (hindlimbs at 180° angle to the torso). Maximal hindlimb extension seizures involve stimulation of the brainstem and they may be induced with either corneal or frontal electrodes. The endpoint is much clearer than for minimal seizures and is defined when the angle of the hindlimbs to the torso exceeds 90 degrees (although it is usually 180 degrees). Partial limbic / Psychomotor seizure response: is manifested as rhythmic face and jaw movements and extensive forelimb clonus (e.g., "shadow-boxing" forelimb movements), extension of the neck, rearing/falling, and transient unsteady gait. Peterson, S.L. Electroshock. In: Neuropharmacology Methods in Epilepsy Research (book), (ed. S. L. Peterson and T. E. Albertson) 1-26, CRC Press, 1998. Swinyard, E.A. Electrically induced convulsions. In: Experimental models of epilepsy - a manual for the laboratory worker (book), (ed. D. P. Purpura, J. K. Penry, D. M. Woodbury, D. B. Tower and R. D. Walter) Raven Press, 1972.